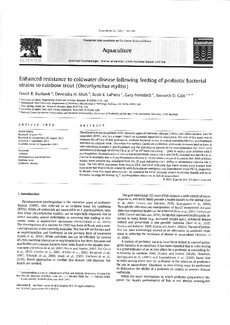 a b s t r a c t Article history: Received 24 June 2011 Received in revised form 29 August 2011 Accepted 2 September 2011 Available online 10 September 2011 Keywords: Probiotic Flavobacterium psychrophilum Rainbow trout Coldwater disease Flavobacterium psychrophilum is the causative agent of coldwater disease (CWD), also called rainbow trout fry syndrome (RTFS), and has a major impact on salmonid aquaculture worldwide. The aim of this study was to evaluate the efficacy of non-pathogenic probiotic bacterial strains to reduce mortality due to F. psychrophilum infection in rainbow trout, (Oncorhynchus mykiss). Candidate probiotics, previously demonstrated to have in vitro inhibition towards F. psychrophilum and the potential to survive in the gastrointestinal (GI) tract, were administered through oil-dressed feed at 106 to 108 bacterial cells g−1, prior to and/or after infection with F. psychrophilum. Administration of two of the ten probiotic strains (C6-6 and C6-8), resulted in a significant reduction in mortality due to F. psychrophilum infection (Pb0.05) when compared to control fish. Both probiotic strains were consistently reisolated from the GI tract indicating their ability to persistently colonize the GI tract. The 16S rRNA sequences from strains C6-6 and C6-8 indicated that these strains were distinct from each other but shared 99.8% similarity with Enterobacter amnigenus and Enterobacter strain PIC15, respectively. Results from this study demonstrate the potential for these probiotic strains to provide benefit and an alternative strategy for managing F. psychrophilum infections in fish in aquaculture. © 2011 Elsevier B.V. All rights reserved.